Whoever said life’s no picnic hasn’t been to the Tri-Valley. There are plenty of places to picnic locally, whether you want to snack by scenic Mt. Diablo views, lakeside lookouts, or with a glass of wine in your hand, the Tri-Valley’s got plenty of options for you. Check out some of the best this area has to offer below! There’s plenty of picnicking possibilities at this popular recreation spot. Take a blanket to its sandy beach, or set up shop at one of its numerous picnic tables. If you feel like taking a dip after you snack, the 80-acre swimming area is open to visitors year-round. If you rather enjoy the water without getting wet, there are also canoe, boat, and stand-up paddle rentals available during summertime. Pro-tip: Grab some picnicking supplies from Rubino Estates Winery’s authentic Italian deli, just a few minutes away from the lake. This huge Pleasanton park is home to several community events from Shakespeare performances to Movies in the Park. Besides plenty of grassy areas to relax, Amador Valley Park also hosts Pleasanton’s Aquatic Center. Between June – September, visitors are welcome to swim or lounge by the pool on weekends between 1pm-5pm. The three pools of varying sizes are surrounded by grassy areas that are perfect for a poolside picnic. Most of Livermore Valley’s wineries allow their guests to picnic while wine tasting on their estates. 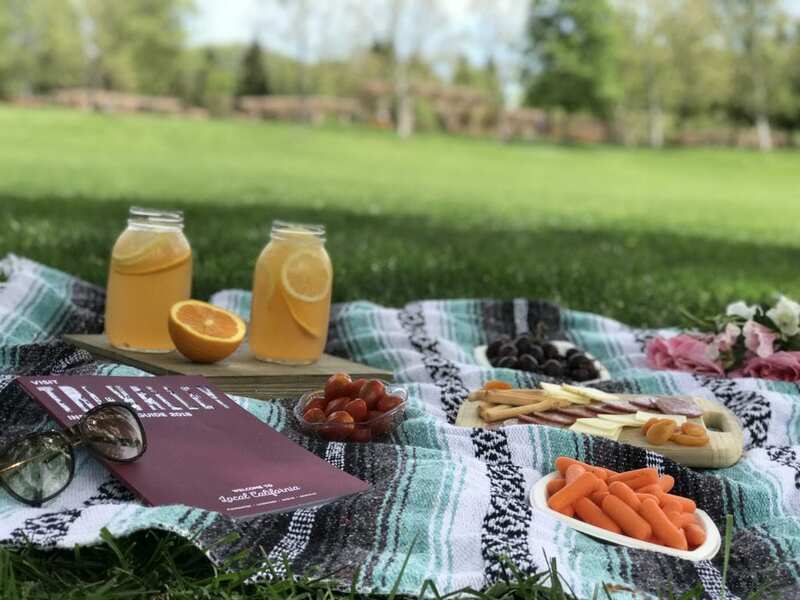 Some wineries allow you to bring your own picnic while others provide purchasable snacks and delicacies that pair well with their wines. Our favorite B.Y.O.P options include Retzlaff Vineyards and McGrail Winery. Wineries with plenty of picnicking space and their own food options include: Wente Vineyards, Concannon Vineyard, and Rubino Estates Winery. 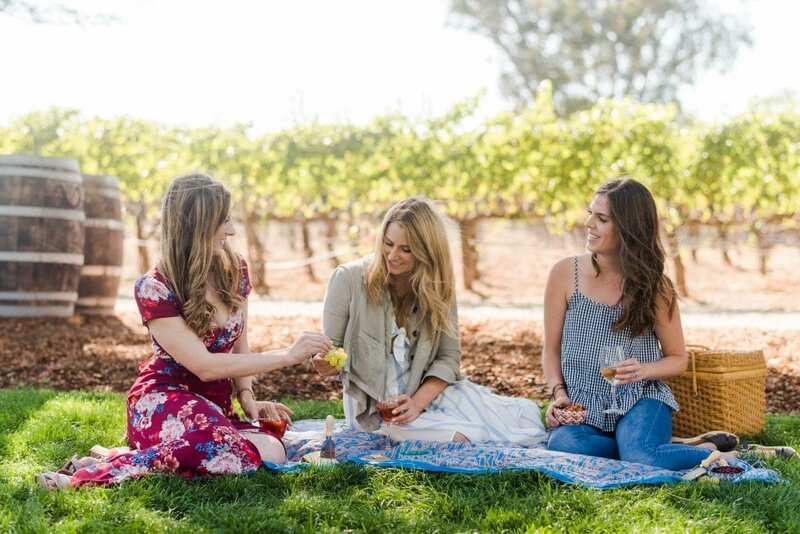 Pro-tip: Check out this awesome blog on the best Picnic Wineries in Livermore Valley. Take your picnic lakeside by visiting Del Valle Regional Park. This gorgeous 4,000-acre space is a playground of rolling hills, trails for walking or biking, and beautiful California Oak trees. Take over one of the many picnic tables, or take a hike to feast with a more scenic view of the lake. Gain access to this area by purchasing a day-parking pass for just $5. Pro-tip: Del Valle is the perfect place to disconnect since there’s barely any cell service. Make sure to let your friends or family know where to meet before making the trek into the park. The views from Morgan Territory are breathtaking, and make for a perfect picnic backdrop. On clear days, visitors can see Mt. Diablo to the west, Mount St. Helena towards the north, and even the snow-capped Sierras to the east from the top of this preserves’ ridges. While there are picnic tables at the Morgan Territory Road Staging Area, close to the parking lot, feel free to take a hike up to a more scenic spot. Pro-tip: Stick to Condor Trail for wide, open paths and keep an eye out for poison oak! Mt. Diablo is home to numerous picnic areas; some offer panoramic views of the surrounding hills and valleys while others are nestled into the mountain’s alcoves for a more reclusive experience. Enjoy the scenic drive up to the mountain’s summit and on your way down take your pick from its various picnic areas. Our favorites include the Livermore Valley Lookout, Bridal Nook, or Lookout Point. Daily entrance to the park costs $10; cash, VISA & Mastercard are all accepted. Pro-tip: Rock City, an attraction within the park, is a great combination of hiking trails and plenty of exclusive picnic areas! This nostalgic picnicking park is sure to impress you with its exquisite close-up views of Mt. Diablo and its miniature train station-themed playgrounds. This 35-acre park has plenty of picnicking tables and open grassy fields to snack on. Thanks to recent renovations, the park’s amenities are modern and well-maintained. Pro-tip: Take a stroll around the entire park and check out the beautiful memorial rose garden! This sprawling Danville park is attached to several playgrounds, a water play area, sports fields, and bocce ball courts. With plenty of picnic tables and large grassy meadows, this picturesque park is the perfect place to spend your afternoon picnicking. Pro-tip: After you’re done picnicking, you’re just a short drive from Blackhawk Plaza. Grab a few cocktails, do some shopping, or catch a flick at this impressing and elegant shopping center. For those looking for a little action after wrapping up their picnic, check out Fallon Sports Park. This park features a BMX course, basketball fields, soccer fields, baseball fields, tennis courts, playgrounds and bocce ball courts along with several picnicking areas. Pro-tip: While this park has plenty of awesome features, it’s also fairly new. The park lacks mature trees to offer its visitors shade. Bring a canopy or umbrella to protect yourself from the sun on hot days! Emerald Glen Park is one of Dublin’s largest parks and is home to several community events such as the Dublin Farmer’s Market and the city’s annual Spring Eggstravaganza Celebration. There are various picnic areas dispersed throughout this large park, as well as plenty of open space if you’d rather snack in the grass. Pro-tip: Bring your swimsuit, because after you’re finished with your picnic, you’re just a few steps away from Dublin’s very own water park – The Wave!